Shimano chains. They just work. Matched with the 4700 Cassette, this combo works well on the flat bar roadie coupled with Deore mech/shifters. Great versatile chain. Trusty and awesome performance as ever from the Tiagra range. Ordered as part of the yearly bike freshen up! Great service from Merlin too. Upgraded to this chain since I changed the cassette and derailleur from old 9spd setup. Chain is solid and shift super smooth as expected from Shimano especially with matched parts (Tiagra 4601 derailleur and 4600 10 speed 12-32T cassette). Great combo and great prices for a superb drivetrain upgrade. Nice quiet chain. Shifts well and doesn't stretch too quick. Great service from merlin too! Usual high quality from Shimano...does exactly what I needed....like-for-like replacement and went on the bike without any issues. 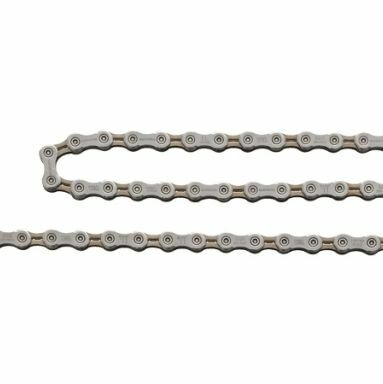 Good quality chain, well made and works really well. Only slight niggle is snap pin. if you are not confident at cutting the correct length of chain and joining it with a snap pin, buy a spare pin or a snap together link. Measure twice cut once.